Love this YOUNG VERSACE Gold & Black BAROQUE Polo Shirt for Fall Winter 2018-19. 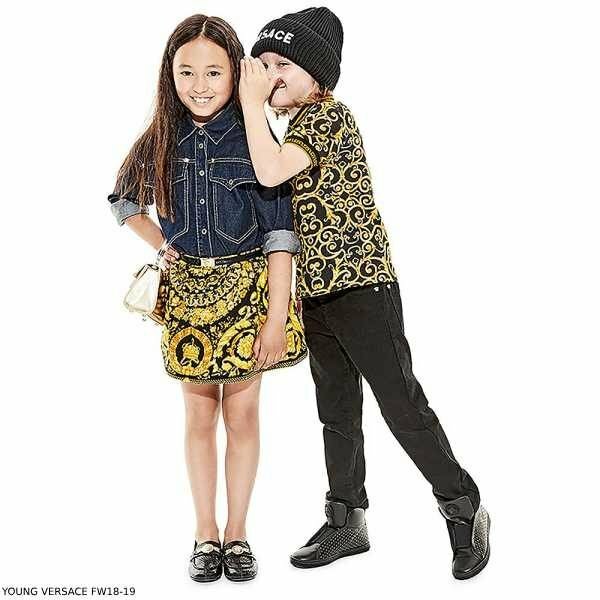 Super Cool Streetwear Look for Boys inspired by the Versace Adult Collection. He’ll look so cool wearing this boys black classic polo shirt by Young Versace, made in soft cotton piqué with stretchy ribbed trims. It has a gold baroque print, Greek Fret pattern on the sleeves and a metal Medusa badge on the chest. Looks perfect with a pair of black jeans, Versace leather boots, and black logo knit hat. For girls, I love this girl’s black jersey skirt by Young Versace, with a bold gold floral baroque print. It is made in soft, mid-weight cotton sweatshirt jersey, with a comfortable elasticated waist with a gold Medusa head clasp. Looks perfect with a blue dark denim button-down shirt. Complete the look with a pair of Versace black patent leather loafer shoes and gold handbag. Unfortunately, this YOUNG VERSACE Gold & Black BAROQUE Polo Shirt & Girls Skirt is not currently available. You can shop for similar YOUNG VERSACE kids clothes from the current collection online.